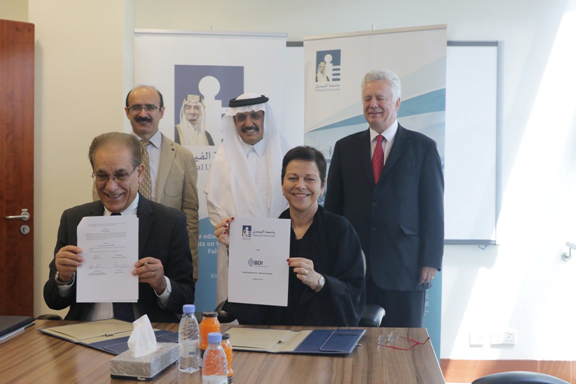 Riyadh- Saudi Arabia: 18 September, 2018 – The GCC Board of Directors Institute (GCC BDI) signed a Memorandum of Understanding (MoU) with Alfaisal University, Saudi Arabia’s first private non-profit university, with the aim of enhancing corporate governance practices in the Kingdom by blending academic rigor with best business practices. This agreement seeks to promote initiatives such as the KSA Corporate Governance Index, which is published by the Corporate Governance Centre at Alfaisal University College of Business, facilitate the sharing of information and knowledge, create increased research capacities, provide thought-leadership and guidance, participate in industry events and seek mutually beneficial opportunities for development. One goal of Saudi Arabia’s ambitious Saudi Vision 2030 is to diversify its economy and develop industry sectors including healthcare, infrastructure and tourism through foreign direct investment. A vital prerequisite for this is fostering a business culture of transparency and accountability. The drive for improved performance measurement reflects the Kingdom’s desire to attract global partners and cement best practice across a spectrum of local public and private entities, and increasingly the Kingdom’s strategies have begun showing results: per the latest 2017 Corruption Perception Index (CPI) launched by Transparency International, Saudi Arabia’s ranking continued to improve, moving up by five places from previous year’s rank of 62.